Lessin, a former student of the late Zecharia Sitchin, in her book Anunnaki: Gods No More and on her website, supports Sitchin’s theory that alien beings known as the Anunnaki visited Earth an estimated 450,000 years ago from a planet known as Nibiru, mined gold to shield their planet, and genetically altered Earth humanoids to be like themselves and used as slaves to mine the gold. Lessin draws from maps, drawings, and art found in archaeological digs throughout the world, ancient stone construction sites and various “marks” and artistic designs found in the earth to prove her claims. One article on the website draws from Sitchen's book Journeys, which identifies the Nazca site as a spaceport for the ships that brought Nibirans to Earth from their planet. The long straight lines streaking across the flat Peruvian landscape there have been perceived by historians as landing strips. But Lessin and other researchers suggest that the 740 different "take-off trails" were the result of massive space ships that were literally taking off from Earth at the end of a visit. They note that the strips left by a force that removed several inches of topsoil and left continuous lines that run amazingly straight over hills and uneven terrain, sometimes crossing one another and crossing the carved drawings of various earth creatures once placed on the site.. Such lines could have easily been made by a "soil-blasting" force coming from a large ship as it was lifting off, the article suggests. Sitchen envisioned the Nibiran pilots, using ray guns mounted on their ships to "doodle" on the earth far below for fun as they waited in the cockpits of their huge craft to lift off. Thus we have the perplexing drawings of various beasts, spiders and creatures of the Earth, which can only be appreciated when viewed from the sky, appearing all over the Nazca landscape. 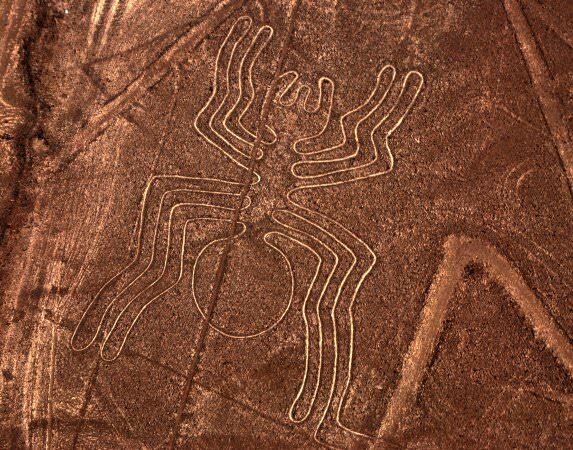 The creators of the Nazca lines and pictures were not carefully digging away the soil to make those images. If Sitchen was right, they were fooling around in their cockpits, using some type of ray gun and the force behind the engines of their ships to make the images. On a mountain not far from the site, Sitchen notes there can be seen lines of grooves forming "circles and squares" that mimic a contemporary heliport. Michael Tellinger, a South African author and researcher, describes yet another possible landing platform that he believes may have been made at Pumapumku, an ancient Bolivian temple site near Tiwanaku. Also following the lead set by Sitchen, Tellinger suggests this site also was built and used by the Nibiru for landing space craft an estimated 13,000 years ago. He even goes so far as to name its builder; Viracocha, the son of Enlil and commander of the gold mining expedition from Nibiru. Enlil is identified in ancient cultures as a Mesopotamian God. This was a chief deity among the Sumerians. The name appears frequently on clay tablets found throughout the Mesopotamian region.